Jamie Johns: "You are a talent bomb!" accompanied by jazz guitarist Jack Grassel. See her schedule for performance information. "Jack and Jill Jazz is a no-holds barred live set of duets in which the couple displays both their impressive improvising abilities and their telepathies interplay. Recorded at a gig near Los Angeles, the music was made even more spontaneous by the fact that neither performer realized that they were being recorded. There was freedom, looseness and lack of pressure. Says Jill, there are no overdubs. Adds Jack; we chose the best of it for the album. The music is very honest, often aggressive and filled with creative surprises. 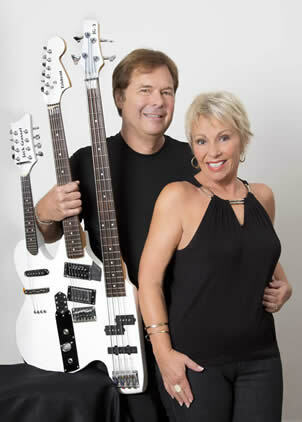 Few voice/guitar duos in jazz history are on the level of Jill Jensen and Jack Grassel. 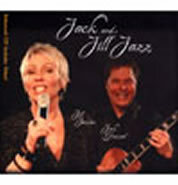 Jack and Jill Jazz is their definitive recording so far." This is a new "enhanced CD" which means, in addition to it being a CD, it will play a three-song "Quick Time Movie" video when inserted into your computer. Get a free quick time player for your computer at www.quicktime.com. The new CD is available for purchase at all Jack and Jill Jazz performances, Lincoln Music in Milwaukee, WI: 3379 S. 13th St.and at Schmitt Music, 1409 Washington AVenue, Racine, WI. CD of the Year and Song of Year - "Song for Your Mother"
October 2006, WI - Frozen Sky Records is proud to announce the release of It’s About the Music, the second CD featuring jazz vocalist Jill Jensen and guitarist Jack Grassel. The married couple collaborated six years on the project. In addition to producing and performing on the CD, Jack composed four new songs and created fresh arrangements to lovingly showcase Jill‘s diverse vocal skills. The twelve song collection artistically mixes Big and small band settings loaded with exciting jazz solos. The Milwaukee Symphony Orchestra principle players string quintet accompanies Jill on the Horace Silver song, “Lonely Woman”, custom arranged by Steve Peplin. Legendary arranger Walt Stuart created three Big Band charts exclusively for Jill. Jill sings in Spanish on one song “Isla Mujeres”, composed and performed by Argentine virtuoso guitarist Guillermo Espinasse, and recorded in Cancun, Mexico at Machine Head Studio. Other recording sessions took place in: Brookfield, WI at Public Record; Racine, WI at Andrews Brothers Recording; and in New Berlin, WI at DNA Digital Systems where the CD was also mixed and mastered. The CD design is by The Weber Group, Inc. of Racine, WI, with photography by Keith Watling and Sue Ruggles. The twenty-four musicians listed above, who contributed their highly skilled talents to the CD, reads as a “Who’s Who” of the Midwest‘s most accomplished. Included is nationally acclaimed Howard Levy on harmonica, (founding Member of Bella Fleck and the Flecktones), seven time Grammy Award-winning drummer Paul Wertico, and Dane Richeson, recognized as one of the most versatile virtuosi in percussion. It’s About the Music was almost never heard. In March of 2004, Jack was stricken with heart infection and toxic shock. Jill was told he had a “10-20% chance” to live. Jack beat the odds to miraculously survive, but production stalled for two years while he struggled to regain health. The Milwaukee music community rallied to give a special concert, which eased their burden of huge medical bills. The couple credit the CD’s completion to the outpouring of spiritual support from fellow musicians, family and fans. Although Jack is not fully recovered, he and Jill consider the release of It’s About the Music a triumphant finale to that difficult period. Always a surefire crowd pleaser at any occasion, Jill and Jack are in demand as a duo or small ensemble as well as Big Band. The jazz duo sizzles onstage. Jill Jensen grew up singing in a home where the music of choice was swing era and jazz standards. She is well known in southeastern Wisconsin as a vocalist, actress and television spokesperson with a smooth confident stage presence and a 'smile' in her vocal delivery. A fan says her voice is “Victoria’s Secret for the ears.“ Jill gained musical fame through singing engagements with numerous bands and shows, most notably since 1998 with her world-renowned husband, Jack Grassel. Jack produced her first CD, “Seems Like Dreams” in 2000. Just Jazz Guitar magazine wrote: ‘Jensen's voice is strong and self-assured... Grassel's overall skill and musical approach are the perfect compliment to Jensen's smooth and confident vocal styling and phrasing.’ Dave Luhrssen of The Shepherd Express said: ‘Jill’s expressive voice sparkles with the sheer delight of singing as she wraps around lyrics and their emotional implications. Blended with Jack’s stunning command of the guitar, they perform music that speaks in an easily understood and enjoyable dialect.” In addition to performing with Jack Grassel, and the musicians on the CD, she has sung with: Ed Thigpen, Marlene Rosenberg, Ernie Adams, Chip McNeil, and Richie Cole. Jack Grassel was voted one of the ”Ten Best in the U.S...” by Guitar One magazine, March 2000. “Upon hearing him seamlessly weave bass lines, rhythm chords, and melody lines - all at the same time - as well as noting his incredible command of the instrument, we knew he was a shoe-in. Simply put, he sounds like no other guitarist.” He is a winner of six W.A.M.I. (Wisconsin Area Music Industry) Awards as Guitarist or Jazz Artist of the Year. For decades, guitarists all over the world have studied his many books, columns, compositions and recordings. Jack is known for his invention "The Superguitar," on which he plays bass and guitar simultaneously. He enjoyed the personal tutorage of his mentors, Tal Farlow and George Van Eps, which helped father his unique style. He has accompanied the biggest names in entertainment. A short list includes: Luciano Pavarotti, Rosemary Clooney, Nancy Wilson, John B. Williams, Roy McCurdy, Frankie Laine, Maureen McGovern, Cab Calloway, Jay Leno, Bob Hope, Louie Bellson, Vic Damone, Tom Jones, Al Martino, Joel Grey, Mel Rhyne, David Benoit, Ira Sullivan, Ed Thigpen, Howard Levy, Buddy Montgomery, Doc Severinson, Eartha Kitt, Helen O'Connell, Roger Williams, Percy Faith, Lucas Foss, McCoy Tyner, Rufus Reid, Slide Hampton, John Scofield, Ritchie Cole, Stu Katz, Michael Feinstein, Stanley Jordan, Hod O‘Brien and Stephanie Nakasian. "Since this column began nearly two years ago, I've had the pleasure of listening to a lot of great music by local artists. 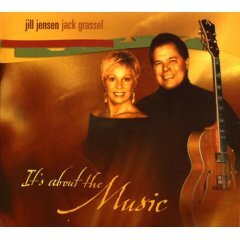 None, however, has impressed me as much as 'It's About the Music' by vocalist JIll Jensen and her guitarist husband Jack Grassel. Beginning with a super swingin' 'Beyond the Sea,' the couple appear to be on a mission. Not content to merely cover the standards, Jensen & Grassel, accompanied by a host of guest musicians, aim to inject new life and energy into them. They succeed on both counts. While song to song, 'It's About the Music' touches many musical bases, the stand-out for me is their ultra-groovy rendition of 'Girl From Ipanema.' Grassel, who's no slouch on the guitar, flexes his muscles as a songwriter, adding new lyrics and chord progressions. This number is perfect for Jensen's silky smooth, pitch-perfect voice. VERY highly recommended." There is so much heart laid bare in this CD that I almost cried (now, there's an admission) when I heard some of the tunes. Knowing your off-the-charts love for each other and music, plus the things you went through and will continue to face, this is not an album by two people; it's an album by one unbelievably transcendent union of two exceedingly talented individuals. If I'm not being blasphemous, it's like the Christian concept of the Trinity. Jill Jensen, voted 'Best Female Vocalist' for 2000 & 2001 by readers of Southeastern Wisconsin's Journal Times, sings Jack Grassel's fresh arrangements of jazz standards. "Smooth and confident. I couldn't avoid feeling the smile in her vocal delivery. Stage presence will never be a problem. Grassel picked Chicago's best jazz performers for this session and the result is wonderful. This CD is a most satisfying listening experience." "Let the organic feeling of Jill's sensual voice enchant you with a sound to remember the rest of your life." "Your voice is Victoria's Secret for the Ears"
around words and their emotional implications." "Jensen's voice is pliable and seductive. The whole CD is a fun experience." "Jensen presents a clear and sometimes playful approach to seven jazz standards." Despite the cliché, they do make beautiful music together". "Always a sure-fire crowd pleaser, Jill's sparkling jazz vocals sizzle in her duo, combo or Big Band."